growing up, there was always a polaroid camera in our house, somewhere. left on a shelf, loaded with a half pack of film, mostly forgotten. save for the few occasions deemed worthy enough to warrant a polaroid picture. a backyard cookout, a newly redecorated bedroom, a first dance. I don't remember the polaroids so much as the presence of the camera, the casual availability. this is what it was to be a kid in the seventies and eighties. you grew up with polaroid. that flash pop zip whir sound and the magic of an image appearing in slow motion, in your hands, before your very own two eyes. this is not what it is to be a kid today, not even close, picture taking looks infinitely different. but I'm happy to report (giddy, actually) my own two kids are growing up with polaroid cameras in the house. too many, maybe, but they'll have the memories. they'll have the polaroids. and if if I do my job right, they'll keep polaroid alive long after I'm gone. 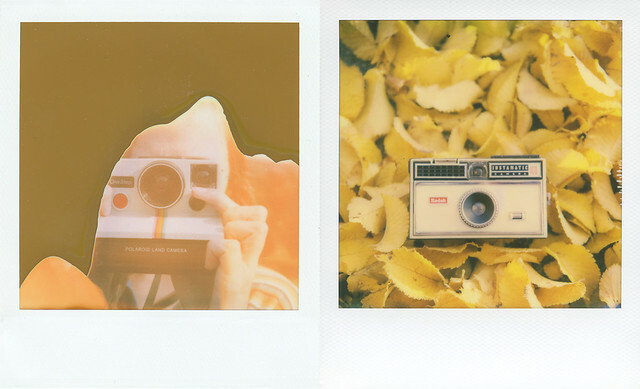 growing up, joyce shot with the iconic kodak instamatic just like that one pictured above. gifted to her by her grandmother when she was just twelve or thirteen, this little camera cracked open the world of photography for her. it came from the world war II photography shop her grandmother owned in amsterdam but has long since closed. who knew what that little camera would lead to? that it would lead to this moment? how can anyone know, really, what will happen when you put a camera in the hands of someone? what they will see with it, see through it, what stories will find their way onto rolls of film, to be bathed in chemicals and born as the photographs that lay testament to that one profound truth: I was here, we were here, and this is the story.